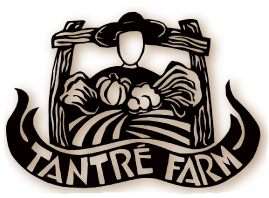 Tantré Farm’s mission is to produce and distribute fresh, organic produce, while serving as an educational, sustainable, and social network for our surrounding community. We hope to achieve this mission through our CSA, Farmers’ Markets, Farm-to-School program, local stores, local restaurants, schools, and other community connections. Our goals at Tantré Farm are to produce fresh, healthy foods for the local community, provide quality of life for the farmer, and sustain economic viability for the farm with care and respect for nature’s diversity. How does our Summer CSA work? How does our Extended Fall CSA work? How does our Thanksgiving CSA work? How does our Winter Solstice CSA work? Cut cabbage into quarters, cut out stalk and cut into strips. Blanch for 3 minutes in generously salted water; put into ice water to stop cooking. After this step, cabbage can be frozen, put into fridge, etc. until dinner preparation starts. Finely chop the onion, sauté in the butter, add the bacon and keep over medium heat. Add the cabbage. Salt, pepper and nutmeg to taste, cover, and let sauté for a couple more minutes. Serve. *Tip: Best with roasts, potatoes, or pasta.